I read in another recipe for crackers to make them really thin, by folding the aluminum foil in half, and using a rolling pin to spread out the mixture. It worked great, and made the crackers very even in thickness. When they first came out of the over, they were still quite soggy and hard to cut into pieces. The extra 5 minutes (I left them in about 8 minutes) really made the difference in making them crispy. 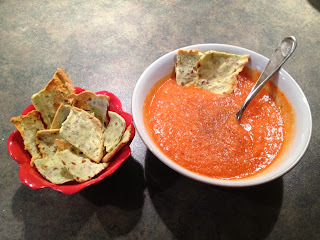 Crackers are wonderful when they are crispy and can be dipped in soup and not get soggy. These crackers really meet the mark! The first bite had that nice crunch! They were thin enough to allow the crispiness, but thick enough to be satisfying. I like the garlicky flavour, but would probably add even more garlic next time. Dipped in the golden goddess soup (http://idealproteinrecipesandfoodreviews.blogspot.ca/2013/08/review-of-golden-goddess-soup.html) made for an extremely satisfying meal. I loved the quantity of crackers, and they were sturdy enough to be dipped into the coup.